[A Readers Guide: I know that not everyone has time to read this long piece but I thought I would make this an easier read by giving a short guide. I acknowledge that my piece is approached by different audiences and to make it a quicker and easier read I’ve decided to make this guide to help those different audiences. I’ve included each paragraph with a number so my instructions will include the number of the paragraphs and section names. I hope this helps. However, to all readers, one quick way of skimming is to skip any long quotes written within each paragraph. Tibetan readers: read paragraphs 1, skip 2, and continue from 3-4. 5 & 6 is optional. Skip the first half (from paragraph 7—20 since I feel most Tibetans already understand and know that section). Read from “Genealogies of Loss” to the end (paragraphs 21—33). Feel free to skip quotes within each paragraph. Non-Academic readers: Read everything except for paragraph 2. Feel free to skip quotes within each paragraph. (1) In the past few years, an unprecedented number of Tibetans have chosen to drink kerosene and light themselves on fire. What are self-immolations about? They are often framed as protest by the popular media, but is that all they are? Self-immolations are deeply complex, and involve layer upon layers of meaning that need to be considered. In the following, one of the ways I interpret them is by considering the self-immolations as producing historical narratives of Tibet that counter China’s hegemonic narrative on, and current political control of Tibet. Walter Benjamin explains that one must, “seize hold of a memory as it flashes up at the moment of danger,” in order “to articulate the past historically” (1969:255). Protests of any kind in Tibet are considered criminal by the Chinese colonial state. Tibetan self-immolators, however, are literally “seizing hold of a memory” by immolating “as it flashes up at the moment of danger.” Memories and re-evocations of past losses and resistance disrupt and challenge the dominant Chinese narrative of Tibetans as prospering under the colonial state’s modernization projects that are constructed and controlled by China. Self-immolations as performances express the voices of the subaltern (Chakrabarty 1992) that the colonial state tries to silence (Trouillot 1995). These individuals, however, refuse to be silenced and have chosen instead to self-immolate in order to be heard. Their actions force witnesses to re-position narratives of Tibet away from “the center” of the Chinese colonial state, towards the “peripheries,” in Tibet (Dirks 1990). Although popular news coverage on the issue has been shallow at best, the self-immolators have indeed shifted the media’s attention away from Beijing, and into the towns of Amdo and Kham where self-immolations have taken place. Also, while the self-immolators have captured the attention, however fleeting, of people around the world, they have especially captivated other Tibetans. This proves that self-immolator’s voices are generating changes, actions, movements, and consciousness—especially in Tibetan communities inside and outside Tibet. In fact, my motivation to write on the subject is itself proof that they are generating action. Although there has been a growing number of analysis written on self-immolation—notably in the special issue on self-immolations released by the online journal Hot Spot Forum: Cultural Anthropology in April 2012 and a symposium held on self-immolations on May 14th and 15th 2012 at College de France, in Paris, France, both of which I’ve used in this research—there has been little analysis of self-immolations as communicative acts and as examples of testimony by Tibetans for Tibetans. Like Makley (2012), I too consider self-immolations “a dialogic medium of communication.” For this reason, I want to explore self-immolations—the act itself and the moment it generates—as producing counter-narratives of Tibet that challenge China’s historical narrative on the region. (3) As I sat on December 5th, 2013, trying to contextualize the self-immolations that have been taking place at an increased level inside Tibet, I received news that another self-immolation took place the day prior in the town of Meruma, located in Amdo Ngawa inside Tibet. Kunchok Tseten was a 30-year-old Tibetan man with a wife and two children under five years of age. He set himself on fire while shouting slogans calling for the long life of the Dalai Lama, his return to Tibet, and for Tibetans “inside and outside of Tibet” to “unite” (Phayul. December 4th 2013). According to reports, he died soon after his self-immolation (ICT, December 5th 2013). However, Chinese police took his body away after a brief clash with Tibetans who tried to prevent authorities from taking possession of his body. Soon after the incident, local authorities arrested his wife, several of his relatives, and some Tibetans who were charged with fighting with the police during the self-immolations. As of now, reports indicate that his body has not been returned to his family. (4) Kunchok Tseten’s self-immolation makes this the 124th self-immolation by Tibetans that have taken place inside Tibet. According to International Campaign for Tibet’s (ICT, 5 Dec. 2013) website, as of December 10th, 2013, a total of a hundred and thirty self-immolations by Tibetans have taken place since 1998. The six that occurred outside of Tibet took place in India and Nepal, including Pawo Thupten Ngodrup, the first Tibetan to self-immolate in India in 1998. Nineteen self-immolators have been women and hundred and eleven have been men. Of the 124 self-immolations inside Tibet, a hundred and three are known to have died, twenty-four self-immolators were age eighteen or under and eighty-one were lay Tibetan women and men. fourty-three were from Amdo Ngawa, Tibet (known in Chinese as Qiang Autonomous Prefecture, Sichuan). Among those in Ngawa, twelve were monks from Kirti monastery in Ngawa, ten were former monks from the same monastery and two were nuns (https://www.savetibet.org/resources/fact-sheets/self-immolations-by-tibetans/). (6) This is my attempt to write about self-immolations by exploring the narratives self-immolations produce and the types of narratives they are generating from its audiences. This way, I hope to contribute my own narrative that attempts to memorialize and historicize in text what I call, the moment of self-immolations, and add to the small but growing narrative on self-immolations by Tibetans. (7) Scholars across disciplines have attempted in their own way to explain why the Tibetans are protesting in the particular fashion of immolation. While many have tried to explain self-immolations with an historical, Buddhist, or economic analyses, almost all agree, “self-immolation cannot be explained by individual motivation” (Shakya 2012, Hotspot). However, I found Barnett’s analysis to be the most compelling (2012, Tibet is Burning). The act of self-immolation requires a fiery protest that assumes death is inevitable. This means every self-immolator performs the act knowing that they will most likely die. This is confirmed when reading testimonies that were written or recorded by self-immolators such as Lama Sobha. Barnet argues that “[s]uicides that are responses to a political event or action by the authorities are not at all unusual in Tibetan society: they have long had a social value among Tibetans which made them meaningful acts” (58). Occurrences of Tibetans “swearing the oath to die” in order to “defend their country” when dangers to nationhood and identity were perceived have been recorded throughout Tibetan history. In the last century, evidence of these incidents could be found, according to Barnett, during the British intrusions (1880s-1900s), the People’s Liberation Army’s invasion (1940s-59), Cultural Revolution (1960s-80s), and during the guerrilla warfares of the Chushi Gangdruk inside and outside Tibet (1950s-70s) (59, 60). Indeed, a more in depth look into the willingness by Tibetans to give up one’s life when homeland and nationhood were threatened can be found in Carole McGranahan’s book Arrested Histories (2010). Although the self-immolators do not explicitly take an “oath” to die in order to defend their country, they take on the act knowing they will likely die in order to preserve the Tibetan way of life. a formal written or spoken statement, especially one given in a court of law. (8) Among the ­­­130 Tibetans who have self-immolated thus far since 1998, according to Barnett (2012:41, 54) and other scholars, only a few left behind “written or spoken” testimonies about their decision to self-immolate. Although not every self-immolator left behind written or spoken text, the act of self-immolation as protest is itself a performance of testimony. The Oxford dictionary defines testimony as “a solemn protest or declaration.” Almost all self-immolators shouted an amalgamation of “declarations” that included references to “the Tibetan nation or the Tibetan nationality […] call for the nation or the people to be protected from suffering, to be united, or to be given freedom. […] [The] importance of Tibetan Buddhism, […] the Dalai Lama and call for his return to Tibet” while they were still in flames (54). Official narratives on Tibet inside Tibet are controlled by the state and narratives critiquing or opposing the state’s authority are viewed as criminal and therefore, punishable. Self-immolations are condemned (Kai & Daqian 2013) because 1) their messages are in direct violation of the state’s laws and 2) they produce narratives about Tibet, Tibetans, and China. For the purposes of understanding these as counter-narrations, I view self-immolations as performances of testimony and acknowledge, as Rothberg put it, the “importance of testimony as a mode of articulating the suppressed truth of colonialism” (2010:25). Tenzing Rigdol, Kirti-From the Ashes of Agony. (9) The self-immolators communicate their testimonies through their chosen medium of immolation because in the moment of immolation they take away the state’s narrative authority on themselves as Tibetans. By taking back the state’s authority as narrator, self-immolators establish themselves as narrators of their own subjective realities under the current Chinese colonial state. The Oxford dictionary further defines testimony as implying “evidence or proof provided by the existence or appearance of something.” Using this definition, I argue that the self-immolators’ immolations, their charred bodies, are evidence or proof of the existence of Chinese state-sponsored violence on the Tibetans—making them active agents that speak against the state, rather than the general assumption in the media that characterize them as passive. In performing these testimonies, the self-immolators are “enable[ing] and produ[cing] a new understanding of, […] what has remained unconscious and unarticulable” (Rothberg 2009:213) for themselves and those that become witnesses to their act. (10) Self-immolations thus far have not occurred in isolation; most of them have taken place in public spaces. In Katia Buffetrille’s article “Self-immolations, the Changing Language of Protest in Tibet” (2012), Buffetrille brings attention to how most of the self-immolators that took place in Tibet chose to carry out the act of self-immolation in front of official state buildings, monasteries, and in the market place (14). All of these places are public spaces frequented by both Tibetans and Chinese. Because most self-immolators chose such public spaces to immolate, it is not hard to decipher that they wanted their actions to be witnessed, producing an event for those that witness the act, and in so doing produce audiences for the act. (11) In Multidirectional Memory, Rothberg summarizes Felman and Laub’s psychoanalytic thoughts on the “performative dimension of testimony [as] involv[ing] two figures: the traumatized victim, who is not yet in possession of her [or his] own experience, and the listener to whom the testimony is addressed, who ‘comes to be a participant and a co-owner of the traumatic event’” (2009:214). In Felman and Luab’s psychoanalysis, the therapist allows for the co-production of a narrative that allows the victim to articulate more completely their experience. However, in the event of a self-immolation, the witnesses are “not yet in possession of [their] own experience [of state violence]” and the self-immolator who “comes to be a participant and co-owner of the traumatic event” through their chosen medium of immolation. Echoing Felman and Laub’s thoughts on testimony, both the self-immolator and the witnesses become active agents in producing the moment of self-immolation—the self-immolator as the producer of the act and the audience as witnesses of the act—and together they all become the producers of that moment and bearers of that particular memory of self-immolations. But to who specifically are the self-immolators in the moment of immolation directly speaking to? Who are self-immolators speaking to? (12) When self-immolations began to rapidly increase in 2012, many journalists and activists—including exile Tibetans—argued that the immolations were “desperate” attempts by Tibetans taking extreme measures to draw international attention to the deteriorating social, political and cultural issues faced by Tibetans inside under the current Peoples Republic of China’s (PRC) administration. While these interpretations may retain some truth, it is important in thinking about self-immolations as testimony. What were self-immolators specifically saying before and/or during the act of self-immolation and who these messages were directed towards? (13) In “Political Self-Immolation in Tibet,” Barnett’s findings reveal that the majority of the written and spoken testimonies left behind by self-immolators called “on the importance of the Tibetans acting to preserve their ethical and cultural identity” (2012:54). Although Barnett and other scholars specifically examine the material testimonies (letters and audio) left behind by nine self-immolators, the majority of self-immolators did not leave behind material testimonies; however, as they went up in flames shouting messages similar to the material testimonies that were left behind, they performed their testimonies. In all of their testimonies the self-immolators called on “Tibetans” to “unite,” based on this it becomes clear that they were speaking to Tibetans first and foremost. (14) Although local Tibetans witnessing the initial self-immolation become their first audience, by calling on “Tibetans” (and more recently “Tibetans inside and outside”) while invoking “the Tibetan Nation” (ICT 2013), self-immolators were also speaking to anyone belonging to the pan-Tibetan identity—generating and encouraging what Shakya identifies as an “ethno-nationalistic movement.” Shakya explains ethno-nationalism as “mobilization and organization centered on shared ethnicity and territory rather than on questions of particular rights or grievances” (2012:23, Tibet is burning). However, before I get into how Tibetans that identify with the pan-Tibetan identity responded to the immolations, I want to first look into the initial response to the immolation on the ground as the act took place. (15) As can be seen in the videos of a number of self-immolations in Tibet that have made it outside of Tibet and onto the internet, when self-immolations occurred, the act seemed to generate different responses from the different audiences. This is partly due to the immolators protesting and shouting slogans that are considered criminal by the Chinese state. Local police’s immediate response has been “firstly to try to extinguish the flames in order to prevent the death of the immolator, and secondly to get possession of the immolator’s body. If still alive, officials then tried to take the immolator into custody or to a hospital, or arranged for the immediate cremation of the body if the immolator had died” (Barnett, 2012:45). 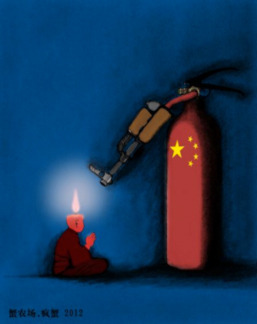 (16) When self-immolations began appearing in international news, the Chinese state responded with a narrative that painted the self-immolators as psychologically and emotionally disturbed, terrorist instigators sent by the Dalai clique, social pariahs, or breakers of the Buddhist precepts. Inside Tibet, state authorities introduced new laws that criminalized the self-immolations and anyone that became involved, adding criminal to the building narrative on self-immolators. (17) Chinese intellectuals and rights advocates took on a different narrative (Barnett 2012, Tibet is Burning). They viewed them as desperate and passive outbursts to the states poor treatment of Tibetans as minorities that would, according to them, sadly go in vain because the state would pay no attention to their desperate pleas (Sperling 2012, Tibet is Burning). However, almost none of the self-immolators make demands on changes in policy towards the Tibetans nor do they call on the Chinese, instead they call on the “Tibetans” to “preserve” the Tibetan culture that self-immolators perceive are under attack by the current colonial state (Shakya 2012:36, Tibet is burning). The audience they directly call on, as I have argued, is not the Chinese state or people but the Tibetan people. (18) Local Tibetans respond in a number of ways when becoming witnesses to the self-immolation and the responses it generated from local authorities. During the immolation, as they become witnesses, some attempt to protect the immolating individual from local authorities, while others keep the crowd of witnesses in line to make sure the self-immolator is not being disturbed while in flames. Other bystanders are recorded as offering prayers and white scarves. In cases where a self-immolator has passed away from the act of self-immolation, groups of Tibetans fight off local police from disturbing or taking the body and carry the body away to monasteries nearby or to Tibetan homes to begin ritual services for the dead to pass safely to the next life, that sometimes also double as commemorative. Large numbers of local Tibetans with or without relation to the dead come to join the service. In situations where authorities came to possess bodies of self-immolators, local Tibetans responded by “besieging police stations to demand that the body be returned to the monastery or the family so that the appropriate rituals could take place” (45). Tibetans who responded to self-immolations both as witnesses and in action show that they, as audiences, also became active participants in co-producing that moment, and therefore, counter-narrative, with the self-immolator. Ngawang Jorden, Contemplation of Selflessness. (19) How do those of us living outside of the towns where these immolations took place, outside of Tibet, come to know about these events? Tibetans who had become witnesses to these self-immolations when they took place also memorialized the moment by capturing them on film, in images, and in spoken accounts and risked their own safety to disseminate what they saw to the world outside the towns and villages in which the self-immolations occurred. Once these captured moments were shared across the plateau and outside Tibet, self-immolations and their testimonies became mobile, traveling beyond where they had originally taken place, capturing many and multiple audiences. For those of us outside, thanks to technology, these testimonies become easily accessible through the Internet. (20) In these accounts and images, the dead and the disappeared, for what seems like a few moments, come back to life to speak to a whole new set of audiences who, along with those on the grounds inside Tibet who also become witnesses in the moment they click to view a self-immolator speaks to them directly. In this way, bodies of the dead and the disappeared, forever memorialized in these images, come back to life to speak to us again and again. Every time they are viewed, they capture a new audience, who in turn, shares it with another set of new individuals; making the process of witnessing and sharing with new audiences itself a form of commemoration. In this way, after bearing witness self-immolations are memorialized in one’s own memory while also feels compelled to also share what was just witnessed with a new audience. (21) The morning of December 7th, 2013, I woke up and began working on this post from where I had last left it off. In-between I decided to check my facebook. As I began scrolling through my newsfeed, I came across a recently released picture of Kunchok Tseten’s charred body. I immediately closed my browser out of shock because I had not been prepared to see an image of him so charred that also captured the moment of his death. Death is personal and intimate, yet he chose to display his death so publically. Seeing that image put me in shock. The shock was soon replaced by a sense of loss—another death by immolation, another Tibetan life lost. This made me ask myself: why was I taking Tseten’s death, and all the others who had also died or survived their self-immolations, so personally? Also, why were Tibetans inside and outside, also taking self-immolations (including the actions, suffering, and deaths) so seriously and personally? Kunchok Tseten self-immolated on December 4, 2013 in Amdo Ngawa. (22) Shakya’s correct to describe that these feelings generate “ethno-nationalist” sentiments; however, I find the terminology too limiting to account for the sense of loss that is deeply felt by Tibetans individually and collectively across the globe. Cruikshank convincingly argues that the same story can have “multiple meanings depending on location, circumstances, audience, and stage of life of narrator and listener” (2000:43). 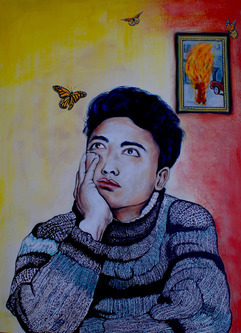 For the Tibetan audience, I believe these self-immolations trigger their own memories of personal and national losses. Forcing them to remember their own genealogies of loss and pain (that are both personal and collective) accumulated (literally and/or inherited) over the course of their life; spanning from when they first lost their homes to the Chinese, all the losses that followed that invasion up to current status of Tibetans as displaced and/or refugees in exile, or living as minorities under the current Chinese colonial authority in Tibet. (23) What do these losses look like? In The Pastoral Clinic (2010), Garcia explains Williams’s “structures of feelings” concept as “actively felt sensibilities derived from lived, material histories,” and how “at any given time there are multiple structures of feeling in operation, corresponding roughly to the generations living at that time. Each generation creates its own structure of feeling in response to the world it inherits” (92). When looking over the age of those who self-immolated, the majority of them are between the ages 20-30, meaning they were all born after the PRC invasion of Tibet. Using Williams’s analysis, it appears that one of the ways the current generation of Tibetans are expressing their “structures of feelings” is through self-immolation, in response to the world they have inherited. (24) According to recent works (Shakya 2012, Tibet is burning. Fischer 2012) that take a closer look into the recent history of China’s governance of Amdo and Kham (from 1980s to the present) where self-immolations numbered in the highest, the rise in dissent and protest coincides with the increase of state management in these areas (modernization projects) and the loss of local control over their ways of life. These intrusions by the state on local autonomy are being viewed by Tibetans, according to Shakya, “as a threat to local identity and culture” (2012:32, Tibet is burning). However, in addition to these recent incursions by the colonial state, I argue we must consider longer, cross-generational histories of Tibetan losses and sufferings rather than view self-immolations as just a reaction to recent suffering and loss caused by contemporary state-development projects. Mural by Karma Tsechoe & Friends. (25) Self-immolators seek to testify to successive and interconnected epochs of disenfranchisement traceable back to an original loss shared by all Tibetans: the loss of nation. In other words, self-immolators are absolutely about responding to terrible local issues in their communities but they are also about the loss of nation. This is why they are explicitly framing local struggles in terms of a history of nation and loss. These losses can be genealogically traced to the loss of homeland during the Chinese invasion, the destruction of culture and identity during the Cultural Revolution, the loss of local autonomy in the development era inside Tibet, loss of lives in the 2008 and 1980s uprisings, and for those in exile, the loss of personhood experienced as non-refugee refugees (dlo08, October 2nd, 2013) or as displaced transnational immigrants in foreign countries, that Tibetans of different backgrounds have experienced both personally and collectively. (26) These losses—lived, remembered, memorialized, and commemorated—“compelled by a set of social and historical situations” (Garcia 2010:71) are felt individually and collectively. According to Halbwachs, the present cannot be explained or understood without referencing the past (1992), I view self-immolations within the context of Tibet’s historical past and take the losses that resulted from that past into account—why else would self-immolators, most of whom were born after China’s invasion, make references to the “Tibetan Nation” when it never existed according to the Chinese state narrative? In a similar fashion, I argue that Tibetans who become witnesses to self-immolations make sense of them by referencing their personal and collective past as “Tibetans” and is the reason why these self-immolations take on personal meanings. “remembering [as] institutionalized through cultural means—in objects, material culture (monuments, books, and suchlike) as well as through practices and rituals of commemoration that may involve, but are not confined to, what participants actually remember from their own experiences. Material culture and acts of commemoration may reference and construct a commonly shared past, and thus communities of remembering” (Kuhn 2010:298). (28) In Tibet, with an increased level of state surveillance on locals in response to self-immolations, commemorative practices by Tibetans have mostly taken on, but are not limited to, artistic and ritual forms that communicate subliminally and explicitly. Initially, self-immolations were being commemorated through ritual means (prayer sessions and death rituals). However, local authorities began criminalizing any form of commemoration. 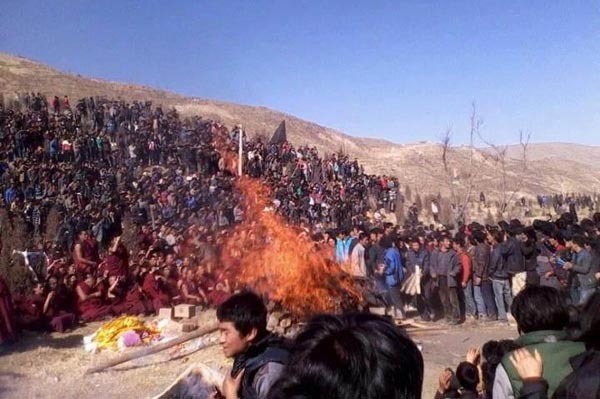 Yet, in some areas of Tibet, locals still continued to carry out ritualized commemorations, despite the threat of violence from the state (Phayul, 23 Jan. 2013). The more subliminal approaches to commemorating self-immolations have been through artistic means. Dorje Lhundup’s cremation attended by Local Tibetans. 4 November 2012. Amdo Rebkong. (28) Tibetan artists have produced a collection of works—through poetry, songs, literature and art—dedicated to the immolations. This genre of work has become popularized both inside and outside Tibet due to its subliminal nature, as it becomes harder for state authorities to track them. They are also easily mobile because their digitized nature allows them to travel easily across the plateau and into exile through the Internet (Kaiman, 4 Dec. 2013). 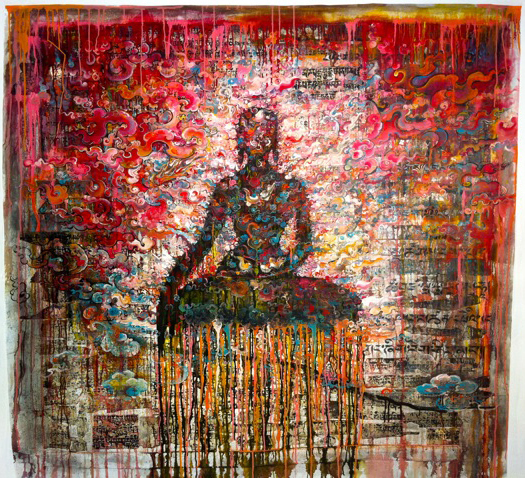 However, due to its popular nature, state authorities have heightened security on artistic expressions resulting in the arrest of Tibetan artists who have been more explicit in their expressions of commemorating the self-immolations (Robin 2012). In exile, commemorations have taken on multiple forms expressed communally and individually in a plethora of ways. 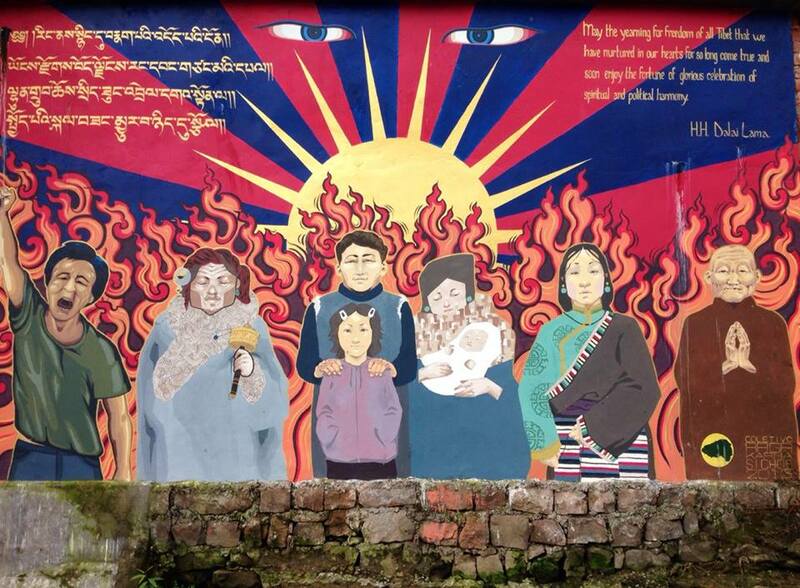 Like those inside Tibet, exiles have also taken to ritual and artistic commemoration; however, unlike those inside restricted by state security, exiles have produced commemorative projects that take on explicit political messaging. Due to the lax nature of the host nations in which Tibetan exiles live, these expressions take on many forms and are still on going. (29) Although commemorative practices by Tibetans inside and outside Tibet are expressed differently, they all share the commonality of dedicating these practices to the self-immolators. Digitized works such as self-immolations themselves, along with commemorative works dedicated to the immolators are consumed and shared collectively at a high rate by Tibetans both inside and outside Tibet. However, in both exile and inside Tibet, one of the more interesting and tragic ways in which the commemorative practices are taking shape has been in the pressure and/or need to also sacrifice something. Inside and outside Tibet, it began with Tibetans giving up celebrating the Tibetan New Year to commemorate, at first, those that died from the 2008 uprising, followed by those who self-immolated (Davis, 11 Feb. 2013). This willingness to also sacrifice something explains how some Tibetans risk their own safety inside Tibet in order to articulate self-immolations with other Tibetans or against state authorities. 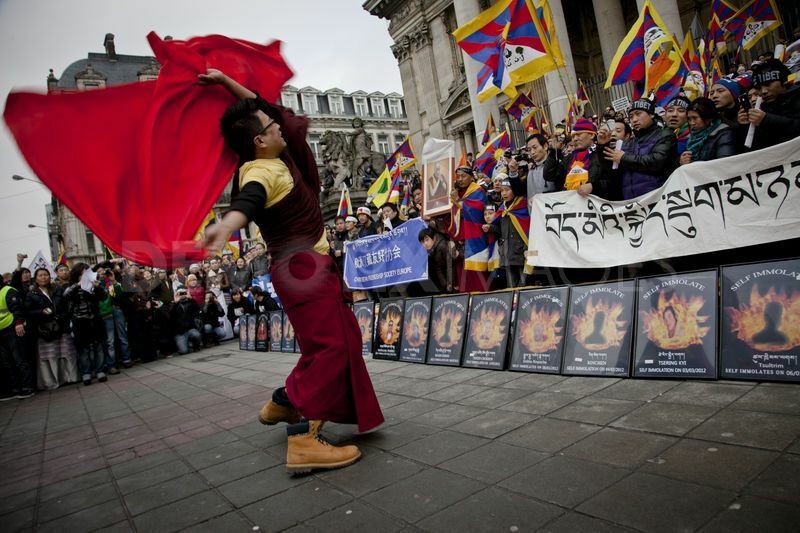 Tibetan National Uprising, Brussels, 10/03/2012. (30) However, this has resulted for some in the tragic need to also self-immolate as commemoration and to speak in solidarity with those that immolated before. Jampa Yeshe’s, who self-immolated and died outside Tibet in Delhi, India, on March 26th, 2012, made references to the self-immolators inside Tibet in the letter he wrote before setting himself ablaze (Bartholet, 30 Nov. 2012). While self-immolations testify to losses and sufferings incurred locally, they are also narratives about the loss of homeland and nation that is expressed, in part, through solidarity and commemoration. This can be seen through instances like Jampa Yeshe’s self-immolation. Yeshe referenced the self-immolations of Tibetans inside in his written testimony in a similar manner to Lama Sobha, who immolated two months prior to Yeshe on January 8th, 2012 inside Tibet. Like Yeshe, Lama Sobha (ICT, 1 Feb. 2012) made references to Thupten Ngodup, the first Tibetan to self-immolate outside Tibet in Delhi, India, in April 27, 1998. (31) Despite the tragedy of growing numbers of Tibetans choosing to self-immolate, other Tibetans inside (RFA, 3 Aug. 2012) and outside (Phayul, 30 May 2013) have made collective pleas asking Tibetans not to take such drastic measures. On a more positive turn, more Tibetans inside and outside Tibet appear to have taken seriously the calls to “preserve Tibetan culture” and to “unite” by self-immolators. The heightened sense of awareness and dedication by Tibetans inside, expressed in a multiple of ways, can be seen on the popular blog High Peaks Pure Earth (www.highpeakspureearth.com). Like those inside, in exile, these dedications have tended to focus more on the need to “work harder” as Tibetans. Exile Tibetan governmental institutions and NGOs have gone in differing but sometimes overlapping directions in actualizing “working harder” in their own existing projects and campaigns. However, on an individual level, Tibetans in exile have put an added sense of personal responsibility on themselves to “work harder” as Tibetans at their own capacities, an example of this can be seen as “Lhakar Pledges” on the popular blog Lhakar (www.lhakar.org/pledge). This response by Tibetans inside and outside Tibet confirms that Tibetans are in fact, actualizing the words of self-immolators. “…the inscribed surface of events (traced by language and dissolved by ideas), the locus of a dissociated self (adopting the illusion of a substantial unity), and a volume in perpetual disintegration. Genealogy, as an analysis of descent, is thus situated within the articulation of the body and history. Its task is to expose a body totally imprinted by history and the process of history’s destruction of the body” (1991:148). (33) In this way, it is important to understand self-immolations as producing historical narratives that counter the Chinese colonial state’s hegemonic control over histories of Tibet. These are histories of Tibet told by Tibetans individually self-immolating and collectively remembering. Barnett, Robert. “Political Self-Immolation in Tibet and Chinese Popular Culture.” Revue D’Eudes Tibétaines (December 2012): 41-64. Print. Bartholet, Jeffrey. “Tibet’s Man on Fire.” National Geographic. National Geographic Society, 30 Nov. 2012. Web. 11 Dec. 2013. <http://news.nationalgeographic.com/news/2012/121130-tibet-burning-protest-china-world/&gt;. Benjamin, W. (1969). Theses on the Philosophy of History (Vol. 255). New York: Illuminations. Unfolding History.” Revue D’Eudes Tibétaines (December 2012): 1-18. Print. Chakrabarty, D. (1992). Postcoloniality and the Artifice of History: Who Speaks for “Indian” Pasts?. Representations, (37), 1-26. Cruikshank, J. (2000). Social Life of Stories: Narrative and Knowledge in the Yukon Territory. UBC Press. Davis, Carlo. “Tibetan New Year Celebrations Canceled In Light Of Immolations.” The Huffington Post. TheHuffingtonPost.com, 11 Feb. 2013. Web. 11 Dec. 2013. <http://www.huffingtonpost.com/2013/02/11/tibetan-new-year-celebrations-canceled_n_2660421.html&gt;. Dirks, N. B. (1990). History as a Sign of the Modern. Public culture, 2(2), 25-32. Dlo08. “Non-Refugee Refugees: Tibetans’ Struggles for Visibility in Bureaucratic India |.” Lhakar Diaries. N.p., 2 Oct. 2013. Web. 12 Dec. 2013. <https://lhakardiaries.com/2013/10/02/non-refugee-refugees-tibetans-struggles-for-visibility-in-bureaucratic-india/&gt;. Fischer, A. M. “The geopolitics of politico-religious protest in Eastern Tibet.” Cultural Anthropology Hot Spot Forum online 4 (2012): 1-6. Foucault, M. (1977). Nietzsche, genealogy, history. Language, counter-memory, practice: Selected essays and interviews, 139-64. Garcia, Angela. The pastoral clinic: Addiction and dispossession along the Rio Grande. University of California Pr, 2010. ICT. “Self-immolations by Tibetans.” International Campaign for Tibet. N.p., 5 Dec. 2013. Web. 11 Dec. 2013. <https://www.savetibet.org/resources/fact-sheets/self-immolations-by-tibetans/&gt;. Kai, Cao, and Wang Daqian. “Xinhua Insight: Tibetan Self-immolation Instigator Contrite.” Xinhua Net. Xinhua News, 08 Feb. 2013. Web. 11 Dec. 2013. <http://news.xinhuanet.com/english/indepth/2013-02/08/c_132160744.htm&gt;. Kuhn, A. (2010). Memory texts and memory work: Performances of memory in and with visual media. Memory Studies, 3(4), 298-313. Makley, Charlene. “The Political Lives of Dead Bodies.” In Hot Spot Forum, Cultural Anthropology. 2012. McGranahan, Carole. Arrested histories: Tibet, the CIA, and memories of a forgotten war. Duke University Press, 2010. McGranahan, Carole, and Ralph Litzinger. “Self Immolation as Protest in Tibet.” Cultural Anthropology (2012). Phayul. “Tibetans Challenge China’s Dictat, To Hold Public Prayer Service for Self-immolator.” Phayul.com. N.p., 23 Jan. 2013. Web. 11 Dec. 2013. <http://www.phayul.com/news/article.aspx?id=32898&gt;. Phayul. “CTA Rejects China’s Allegations, Appeals Tibetans Not to Self-immolate.” Phayul.com. N.p., 30 May 2013. Web. 11 Dec. 2013. <http://www.phayul.com/news/article.aspx?id=33507&gt;. RFA. “Call for End to Burnings.” Radio Free Asia (RFA). N.p., 3 Aug. 2012. Web. 11 Dec. 2013. <http://www.rfa.org/english/news/tibet/burnings-03082012123141.html&gt;. Immolations without Talking about them.” Revue D’Eudes Tibétaines (December 2012): 123-132. Print. Shakya, Tsering. “Transforming the Language of Protest.” Cultural Anthropology Hot Spot Forum online (2012). Shakya, Tsering. “Conversations and Debates: Chinese and Tibetan Engagement with the Broader Discussion of Self-Immolation in Tibet.” Revue D’Eudes Tibétaines (December 2012): 89-98. Print. Sperling, Elliot. “Self Immolation, the Changing Language of Protest in Tibet.” Revue D’Eudes Tibétaines (December 2012): 19-40. Print. Trouillot, M. R. (2012). Silencing the past: Power and the production of history. Beacon Press. 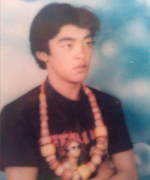 This is a great post written by my friend, Dawa, about the Tibetan Self-Immolations. It is a long read but very interesting and well written, so I wanted to share it with others. This is an impressive lot of work.